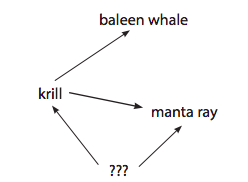 Study the food web below. Which organism best replaces the ??? in the food web shown above? The rabbit population in a certain ecosystem sometimes decreases dramatically. One possible explanation for this decrease is _____. Mark X next to the statements that describe how marine and terrestrial ecosystems are alike. Both rely on the Sun as a source of energy. Both rely on plants as the main producers. Both include decomposers that breakdown dead material. Both include consumers that eat plants and other animals. What is the role played by redworms in an ecosystem? Mark X next to each sentence that is true. They break down organic litter into tiny pieces. They are the decomposers that reduce materials to simple minerals. They help make room for air and water in soil. Their main role is bait for fishing. Which system found in animals is similar to the vascular system in plants? Many organisms have features that attract the attention of other organisms. Mark X next to each phrase that describes why these features are important. Match the structures to their functions in the body. Drag an organ from the left side to its definition on the right side. Mark X next to each function of the central nervous system. Two students were sitting on a park bench at dusk, eating snacks. A mosquito landed on student A’s arm, and she slapped it. When she did that, she spilled a drink into student B’s lap, causing him to jump up. What was the stimulus for student A? What was the response for student B? What can communities do to improve the environment and help monarch butterflies survive? Put bird baths in back yards to provide more water for the monarchs. Make sure all grasses are cut short in the summer. Use pesticides to kill as many other insects as possible. Grow plants that butterflies can use for food. Study the tables below that show the results of a stimulus/response investigation. The object of the investigation is to see how quickly students can move their hands out of the way of a falling cup. Is this student right-handed or left-handed? There is not enough information here to answer the question. Look at the list of organisms in the box. 1. Draw a food web to show how they interact. 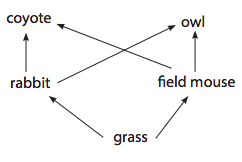 (In this ecosystem, ants and gophers both eat grass; lizards eat ants, and hawks eat lizards and gophers.) 2. 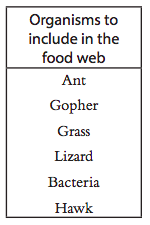 Label each of the organisms in your food web to tell if they are producers, consumers, or decomposers. Two students were talking. Student A was examining the lettuce leaves in a salad he was eating. He said, “Did you know that I am eating energy from the Sun?” Student B was eating a hamburger. She said, “Did you know that I am eating energy that came from the Sun, too?” Do you agree with these two students? Explain in words or with a drawing why you agree or disagree with each student.